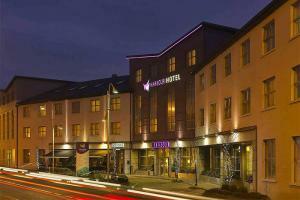 Set in the heart of Galway City, this waterfront hotel is just steps away from Eyre Square and the city center. Families can visit Brigit's Garden, Galway Aquarium, Loughwell Pet Farm and more. With friendly service and comfortable accommodations featuring plush beds, cable TV, Wi-Fi and more, the hotel is the perfect sanctuary after a busy day exploring. Located in Co. Galway, close to Eyre Square.